Prime Minister Narendra Modi on Wednesday hailed the contribution of farmers in the development of the nation and slammed the Congress for ignoring their concerns for the last 70 years. 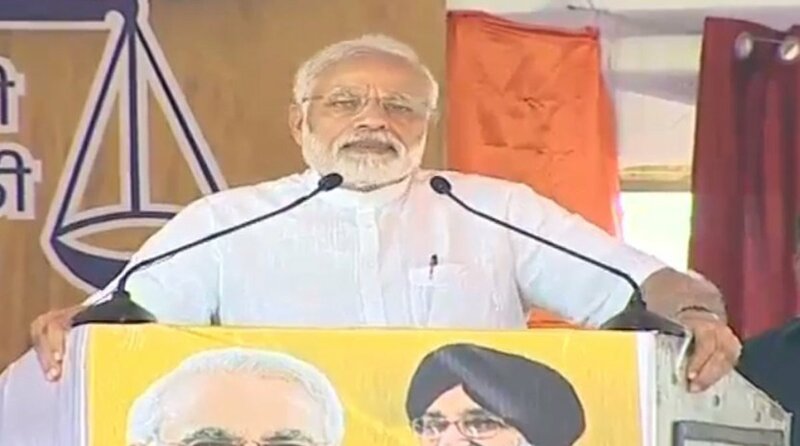 Addressing a huge turnout at a farmers rally in Malout, a municipal town in Muktsar district of Punjab, Modi said that he bows before the farmers for their hard work which has broken all records in terms of agricultural production in the country. “Security of borders, food security or entrepreneurship, Punjab has always motivated the nation. The state has always considered others before itself,” said Modi amid a round of applause from the gathering in this town located just 55 km from Pakistan border. While highlighting the plans and policies undertaken by his government for the betterment of the condition of farmers in the country, Modi accused the Congress party of looking at farmers as vote-banks. “For 70 years, the Congress made commitments but did not do anything for the farmers. They only thought about their own family,” said the PM in the town known for its high cotton production. “The Congress did not recognise the hard work of the farmers even though the farmers put their faith in the government led by them,” he added. The PM said that the Bharatiya Janata Party (BJP)-led NDA government at the Centre worked hard to change the situation of the farmers with the MSP hike decision. He said that numerous other schemes are being implemented which are aimed at preventing crop loss and providing increased irrigation facilities. The PM told the farmers that his government is working towards strengthening the entire supply chain through new godowns and food parks besides a series of measures that would help farmers at every stage from the planting of seeds to the sale of crops in the market. “We promised to double farmers’ income by 2022. We have been working towards that,” the PM said adding that while the farmers are able to sleep peacefully, the “Congress and its allies are losing their sleep”. At the rally, the PM also requested farmers to not burn stubble and advised them to mix it with fertilisers to reduce pollution. Stubble burning has been cited as one of the major causes of air pollution across north India in the last few months.